We are a group of activists, students, workers, artist and mother. Why do we bring this up? Because in the spirit of International Women’s Day, it is critical to build global solidarities as a strategy advocated by a number of activists such as Angela Davis, Nelson Mandela, Che Guevara and Berta Cáceres, to name a few, to stand against the extraordinary challenges emerging out of advanced capitalism, neoliberalism, colonialism, racism, and systems of oppression. Displacement, dispossession and state violence, are just some of the historical realities and memories that the Southern Abya Yala communities in Canada are familiar with. While we do not suggest or even try to attempt at making a comparison with the 500 years of colonial terror experienced by Indigenous Nations in what today we call the Republic of Panama, we sympathize with Ngäbe-Buglé Peoples. We too were forced to flee our homes, and through our immigration experiences, we have gained a small but profound glimpse into the current struggles against Barro Blanco, and we share Ngäbe-Buglé’s pain and righteous anger. FORO-DEBATE, INICIATIVA ZAPATISTA, CANDIDATA INDEPENDIENTE INDÍGENA Y MUJER. Que con su desafío se asombre de nuevo el mundo”. Ante todo lo anterior, nos declaramos en asamblea permanente y consultaremos en cada una de nuestras geografías, territorios y rumbos el acuerdo de este Quinto CNI para nombrar un concejo indígena de gobierno cuya palabra sea materializada por una mujer indígena, delegada del CNI como candidata independiente que contienda a nombre del Congreso Nacional Indígena y el Ejército Zapatista de Liberación Nacional en el proceso electoral del año 2018 para la presidencia de este país. Ratificamos que nuestra lucha no es por el poder, no lo buscamos; sino que llamaremos a los pueblos originarios y a la sociedad civil a organizarnos para detener esta destrucción, fortalecernos en nuestras resistencias y rebeldías, es decir en la defensa de la vida de cada persona, cada familia, colectivo, comunidad o barrio. De construir la paz y la justicia rehilándonos desde abajo, desde donde somos lo que somos. Es el tiempo de la dignidad rebelde, de construir una nueva nación por y para todas y todos, de fortalecer el poder de abajo y a la izquierda anticapitalista, de que paguen los culpables por el dolor de los pueblos de este México multicolor. Desde el CIDECI-UNITIERRA, Chiapas, octubre de 2016. At the beginning of last February, Farwana reported the detention of 100 Palestinian women and children by the Israeli regime since the beginning of the Palestinian 3rd Intifada back in October 2015. From the beginning of the Intifada of Al-Aqsa, in September 2000, until now, more than 1,400 Palestinian women have been detained and locked up in Israeli jails, according to Palestinian sources. 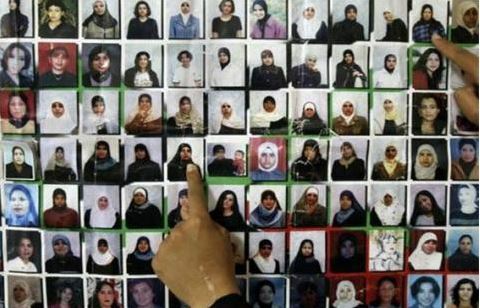 “Forces of the Israeli occupation have detained and imprisoned 1403 Palestinian women since September 2000 until now”, informed activist Abdul Nasser Farwana, specialized in Palestinian prisoners issues, last Monday. The activist emphasized that the list of detained includes mothers, older women, pregnant women, social activists, parliamentarians, students, and young girls. “Four Palestinian women have gave birth in Israeli jails, in very bad conditions”, Farwana added to denounce the tortures and abuses received by the arrested Palestinian women. As a consequence of mistreatments by the Israeli police, a number of those women have been injured or died, Farwana added. “Despite all of these subhuman conditions and the lack of access to basic needs, the Israelis haven’t been able to break the will of these women and they continue to resist, in some cases, carrying out hunger strikes against their detention”. Farwana asked for further efforts to help the Palestinian women, especially those imprisoned in the Israeli jails, and reducing their afflictions. At the beginning of last February, Farwana informed the detention of 100 Palestinian women and girls by the Israeli regime since the start of the Palestinian 3rd Intifada back in October 2015. Tension within the occupied Palestinian territories has deepened after several raids and profanations to the Al-Aqsa Mosque, located in Al-Quds City (Jerusalem), which provoked the rage of the Palestinian people, forcing them to start a new “intifada” to free Al-Quds. The Committee on the Matter of Palestinian Prisoners warned about the detention of al least 6,830 Palestinians since 2015, and pointed out that the figures have grown by 12,7% in comparison with 2014. We would like to invite you to join us in honouring the memory of the hundreds of womyn murdered and missing in Turtle Island, Juarez and Ecatepec Mexico, Guatemala and Honduras, as well as other countries around the world whereby femicide is an ongoing crimeand has become the shame of humanity. B'elejeb B'atz is a calendar ritual where the Mayan womyn is honoured with much love, respect and admiration as the life holder. Maya female healers or Ix'Men will begin the great task of reactivating our connection with Mother Earth and the gentle female light in our collective consciousness to lead us into a new spiritual understanding of Life. In the last two decades, Mayan womyn have initiated a movement of political and cultural restoration whose concerns reflect the region's great variations in environment; the depth of its history and ideologies and the economic and political repression of indigenous peoples in general. On the occasion of Mayan Womyn's Day, an initiative to reach out to the global community, and specifically to the womyn in the native community, was acted on. We are asking for guidance. How can we create a respectful, safe and inclusive space for your participation? It is the intention to engage the community at large to denounce femicide around the world, including the femicide taken place in the territory we occupy, known as Turtle Island. It is the intention to make the connection of the violence being perpetrated against womyn globally. As you can see in this fact sheet; we share similar issues regarding missing and murdered womyn. We stand in solidarity and call for NO MORE STOLEN SISTERS! We believe it is appalling and unacceptable that the Royal Commission on Aboriginal Peoples (RCAP) released its final report in 1996; and that, after twenty years, there has been no change implemented, as outlined in the 20-year agenda, to better the lives of native people in the territory so called Canada. This Mayan Sacred Fire is done every 260 days. Its purpose is to maintain community unity, the integrity of the Mayan families, and to remind us of the fundamental principles which are respect and honour the womyn, mothers and sisters in the (Mayan) community. Social scientist, producer and Human Rights activist, Lúcia works with gender, race and migrant population issues. Unlike most black Brazilian families, Lúcia knows exactly where her roots come from. Her full name is Lúcia Chivee Ijeoma Udemezue and she is Nigerian. Since her early days she felt differences in her African origins. On the one hand, her mother’s side black roots were marked by the stigma of slavery. On the other hand, her Nigerian father came from an important family of the Igbo ethnicity, a village in South East Nigeria. “That union strengthened me, it made me understand more clearly the debates on race issues and the traffick of black slaves after the diaspora, and the comings and goings of the black immigrant population”, Lúcia says. From her mother, Lúcia also inherited her commitment with culture, especially, with black culture. Lúcia takes part in various projects along with Danna Hil, singer and psychologist; Nina Vieira, designer and photographer; and Jully Gabriel, journalist and cultural producer. They are members of the collective called “Manifiesto Crespo” (Frizzy Manifesto), which deals with the debates on the appearance of black women, beginning with the issue of hair. “The bodies of black women have no place in this society”, she affirmed. Trained in Social Sciences at the Pontifical Catholic University (PUC), Lúcia has always been dedicated to black women, especially immigrants. “There was a moment in which the Nigerian community was in a situation of great vulnerability, without a place to go to report abuses from the State. From that moment on, I started to build a bridge and to propose the need of specific public policies”, she remembers. According to her, is important that migrants are not received only by the Federal Police but by other State institutions, so as to strengthen the citizenship of those people. “We made a leap forward with the creation of the coordination of policies for immigrants, in Sao Paulo, now our challenge is to continue working for a more dignified reception of black women, mainly Haitian and African, to organize them and empower them because the protection network is still very fragile for the population”, she said. Being a black, immigrant woman brings along oppressions marked in racism, machismo and xenophobia. Lúcia highlights the importance of the incorporation of this last topic by black, organized women. “We need to start including black immigrant women in the norm”, she believes. Apart from the “Manifiesto Crespo”, Lúcia is a member of the “Oda de Mae Preta” (Ode to the Black Mother) group, which promotes meetings to debate about black, activist maternity. Mother of three-year-old MitzRael, she believes that those spaces of exchange are essential for the strengthening of black mothers and children. “Roda” was created by Lúcia, Nina Vieira, blogger Ana Paula Xongani, sociologist Taisa Souza and plastic artist Renata Felinto. According to Lúcia, July 25, the International Afro-Latin American and Afro-Caribbean Women’s Day is regarded as a moment of celebration. “Our old women resisted oppression and racism, and now we still have to fight so that it can be recognized that black women are at the core of the logic of the society we now have. We need recognition and reparation”, she affirms. Black voices have gained more and more popularity and space, Lúcia says. “I see a many actions and publications by black women: poets, writers, publishing in newspapers and magazines. The daringness of collectives such as ‘Louva Deusas’ is important because they are now debating on black women’s sexuality in the periferic literature as something that gives strength to the women’s movement in the city”, she concludes. On the afternoon of July 25, to commemorate the International Black Latin American and Caribbean Women’s Day and The National Black Women’s Day, the March of The Black Women was held. The Black Women’s March collective was born on November 8, 2015, when women from all over the country marched to Brasilia. This state march (which also has its echoes in other states) in Sao Paulo represents another source of resistance amidt the illegitimate government’s current context. The Black Women’s March, which is celebrated on July 25, to commemorate the end of the First Summit of Black Women of Latin America and the Caribbean, understands the need of continuing to develop unity in the current juncture in Brazil. While the numbers of gender-based violence against white women have decreased by a small percentage, violence against black women is increasing day after day. Apart from the fact that there are insufficient public policies in general, there’s a lack of allocation due to gender-based discrimination, and also for ethnic-based discrimination, which makes it almost impossible for funds to reach black women. “This March is the cry against machismo, homophobia, lesbophobia, transphobia, and against the coup: it’s a cry that today comes out through our collective voice”, says Andrea Alves de Ilú Obá De Min. Among other participants of the manifestation, there was former Senator Eduardo Suplicy, who hours before had been detained by the Military Police after resisting with homeless settlers in the western area of Sao Paulo. According to Suplicy, “the fact that Afro Brazilian women are organizing themselves to take a stand and to fight for their place in the Brazilian life, in work, in the city, in public offices, is very important. (…) Black women can and should play an important role in Brazil and I’m here to support them”. Approximately 50 women organizations gathered in the Roosevelt Square of Sao Paulo to march to the center of the city with a massive column full of struggle, passion, and claims against the outrageous rate of femicides in Brazil: One black woman is killed every 1:50 hours. They were raising the voice for a sector that is politically and socially excluded from the Brazilian present: “The Black Women March today mobilized against the racist coup. We have been raising our claims since last year, on the streets, because this has a direct impact on our lives, every day”, said Agatha Miranda of Levante Popular Da Juventude. Con mucha alegría arribamos al primer Aniversario de nuestra histórica primera Cumbre latinoamericana de lideresas afrodescendientes de las Américas, realizada en Managua, Nicaragua, del 26 al 28 de junio de 2015, con la participación de 276 mujeres de 22 países. En el marco de este primer año incidiendo de cara al Decenio Internacional para las y los Afrodescendientes, compartimos los avances y esfuerzos por continuar socializando y posicionando nuestra Plataforma Política a través de las actividades que hemos venido realizando en estos primeros seis meses del 2016 y otras acciones y participaciones previstas para el resto del año, en seguimiento a nuestro Plan Estratégico 2016-2020.